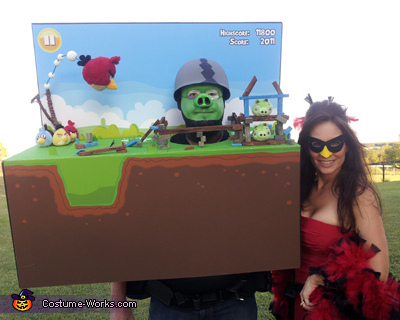 Made this costume from scratch except for a couple of stuffed animals (angry birds) that were added. It took a few weeks from concept to make. Except for the back ground every think was hand painted including my face by yours truly. The costume was made in different layers. Back ground and forground. Parts were made from painted styrofoam and a wire shrink wrapped with blue to match back ground that the main red angry bird is attached to. It was a great fun experience. Tell me what you think!! This is genius! Wish I could talk my Hubby into going all out like this! You guys look great!